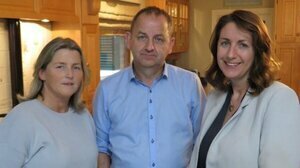 Yet another attack on a proposed direct provision centre in Roosky is indicative of the hate and fear bubbling under the surface of Irish society. It is one thing to feel upset at having a direct provision centre placed in your town or village. The tendency seems to be that this is done without any consultation with the local population. But it is an entirely different matter to want to firebomb a building that is due to house asylum seekers. This is especially so given that the building had a number of staff in it at the time. There has been a noticeable uptick in the far right here. Their talking heads are appearing more and more frequently on social media and their talking points are appearing more and more often in the comments sections of websites. And, what’s more, they appear to be having some success. Anger at government idiocy and greed is being redirected by these same proliferators of hate. Some are likely only opportunists. Climbing aboard a far-right political movement is just a ladder on the way to social and political influence; at least that’s how they see it from their optimistic point of view. But others do indeed have nothing but contempt and hate for any person whose skin is not the appropriate shade of white. There is also an overlap in their beliefs between this racial essentialism and the idea that the world is under siege from a malign communist conspiracy. Asylum seekers, in their minds, are the demographic foot soldiers here to wipe out the white race. Anything to the left of Mussolini is considered “Marxist” is some shape or form. Marxism appears in scare quotes given the consistent misunderstanding, likely intentional, of Marxism and its various offshoots. 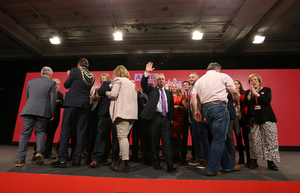 Somehow, in their world, Ireland has become a dictatorship of the communist Cultural Marxists. The same people who will tell you that Leo Varadkar and pals are planning to eliminate the native Irish by means of mass immigration are the very same people who likely think Habermas is a kind of sausage. Often unspoken, but obvious to anyone who understands the history of Marx and Marxism, in the conspiracy theory surrounding Cultural Marxism is that it is really about anti-Semitism. It is not simply that the Frankfurt School was just made up of neo-Marxists like Theodor Adorno and Max Horkheimer. They were also Jewish. And with that in mind, we are simply rehashing the 19th century conspiracy theory about Jewish plans to rule the world. Now, though, it has been updated to include anything which involves fighting for equality and offering refuge to people desperately in need of it. It has become unfashionable (thankfully) to be anti-Semitic. More insidious forms have to be used. Hence we get the conspiracy of Cultural Marxism. The anti-Semitism is not blatant, but it is there as soon as you understand the history of Marxism. What does this have to do with Roosky? It is the same playbook. Insist that there is a conspiracy. One is to colonise the physical landscape of Ireland; the other a move to colonise the minds of people with Cultural Marxism. The solution is simple. Both forms of colonisation can and must be stopped. One by aggressive reeducation and the other by sheer aggression. What happened in Moville and Roosky is a case of the latter. Any person who does not adhere to this strict dichotomy is a Marxist of some shape or form and can therefore be dealt with accordingly. The faux Yellow Vests who have emerged here perfectly illustrated that point in the last few weeks. At one of their protests some anti-fascist activists appeared. A number of the Yellow Vest protestors, none too pleasedabout this, made it quite clear that anything anti-fascist was not welcome at their protest. 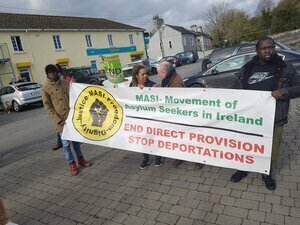 Elsewhere a spokesperson for the Movement of Asylum Seekers in Ireland (MASI) told me that asylum seekers in direct provision are afraid. MASI believe that it is possible that direct provision centres with asylum seekers already living there will be targeted eventually. This would seem to be the next step in the actions of the arsonists. As MASI bluntly put it, “They might be plotting more because they are getting away with it.” MASI, of course, are correct. So far no arrests have been made and the Gardaí have not named any suspects. In the meantime, asylum seekers will have to live in fear as the far right continues its rise throughout Europe. Anti-racism rallies, as uplifting as they may be, are ineffectual against true believers. The people who are convinced that the world is engulfed by a conspiracy to eliminate white people will not be swayed or frightened by a rally or march. Liberals in Europe and the US have a particular disdain for anti-fascist activists, often calling them just as bad as fascists. This, of course, is nonsense as well as being profoundly ignorant of history. Presumably these same critics of Antifa could be found in 1923 telling their contemporaries to ignore the loudmouth in the local Bavarian beer halls. What they fail to understand is that fascism, whether it is nascent or fully formed, does not wince before a well-thought-out criticism. In fact, it welcomes it as it offers the veneer of respectability to be able to engage in debate. After all, aren’t those who choose violence over debate clearly savages? Fascism was not smashed with the use of harsh language. It was smashed by those willing to take on fascism directly. It is no accident that our current far right are so terrified of the spectre of anything red. It was the Red Army who largely crushed the German war machine in 1945. Asylum seekers are a minority of a minority in this country. They want do nothing more than to live in peace. And that is impossible given both the tyranny of the direct provision system, and the fear of an upsurge of far-right violence. The fire of the far right can only be put out by direct action Until that time has come to pass, none of should sleep peacefully. Earlier: You’re Not From Around Here, Are You? 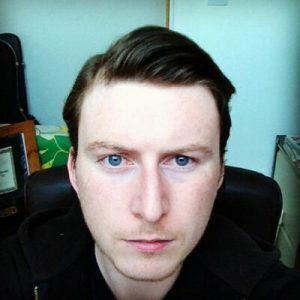 Posted in Misc and tagged Bryan On Monday, Bryan Wall at 11:47 am on February 18, 2019 by Bodger. Gave up after the first 2 paragraphs. All over the place. EDIT: scrolling through I see 1923 and beer hall. Get a grip, Brian. Bryan, you are the only fascist I see around here. @ Bryan, will your sociology finish this semester, so that we can be spared this scutter? ugh all the racists saying that there’s still no actual evidence that the fire was deliberate, I mean I though we had hate speech laws or something? And then on top of it these ignorant rural racists are saying that there are absolutely no facilities to deal with large numbers of asylum seekers in their town? 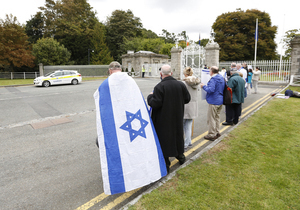 They should be made to welcome them into their own homes, Irish people say they are a christian country when it suits them but the bible says let people into you homes doesn’t it? the sooner these country bumpkins die off and are replaced the better. Is this guy in command of his faculties? In command of the Sociology and Media faculty at Neasden Polytechnic. In 1986. The Left-Right distinction is looking a bit worn these days. Case in point are the protestors outside the Ministers’ houses in recent days. They’re self-identifying as hard-left, but much of the support online is from the hard right. I think it makes more sense to speak of establishment and anti-establishment these days. Hard left and hard right are against everything to do with the status quo. Neither has a chance in hell of ever governing so they will only be defined by their common opposition to the way things are and the current people in power. Agreed, Antifa are savages, and no better than fascists. 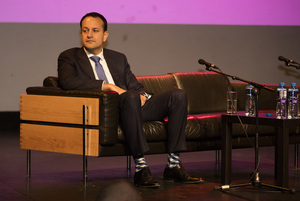 Bryan, it is not a good look that you (and BS) continue to avoid addressing the elephant in the room that is your support for the out-and-proud far right ideologue Gemma O’Doherty in the recent presidential campaign. You signal boosted a person who has since used that increase in visibility to spread vile lies online. You could at least apologise for your poor judgemen. Did he support GO’D really? Amazing. How did this happen? Oh. To be fair, when she was on her anti corruption run I was very taken with a lot of what she had to say and when she was called out for homophobia she was able to produce some ”homopositive’ articles she had done in the past so not sure why the writer has to apologize for being misled by GO’D? It was only once she realized she wasn’t getting on the Presidential ticket did she pull back the mask fully and show her true face. I feel no need to apologize for being taken for a mug. In the run-up to the election, she was only into paranoid conspiracies (Veronica Geurin, Mary Boyle & Madeleine McCann & Tony Blair), and threatening to sue everyone; she only got heavy into the far-right paranoid conspiracies afterwards. Not sure if you are replying to me, but if so, you will note I said I was taken with a lot what she had to say, in relation to anti corruption. Never gave any credence to the other stuff and never really figured her for a heavy weight journalist anymore once she went down that road. You will also note I said she ‘pull(ed) the mask back fully’ so I accept she had already came out with some bizarre stuff prior to the election. However, if you are not replying to me, ignore this post! No bother Ian – in fact I was rreplying to Wario above, but duly-noted. I make no apology for liking what GO’D said on BS. A real person. I also got the impression that she spouts something then forgets about it ten minutes later. Fair enough, but the internet does not. Was she a suitable candidate for the presidency? No, and I expect deep down she knew that, but nobody has explained why she was treated so badly. She raised some very valid points about how the president is elected. Is she a good person? Yes of course she is but like other people of her ilk, Twitter is the silly point of criticism. Post to Broadsheet Gemma, lets be having you, I’m sharpening the nails already. Which way they swipe remains to be seen. Why would he hide it? He is on Gemma O’Doherty’s You Tube channel. Won’t someone call out that DWT”S” on RTE for what it is: racist, heterosexist, transphobic, patriarchal crap. is that what they call “weaponised anti-Semitism”? It seems Rowan Croft is making a career from driving a far right agenda. At one point I liked GO’D but she has ran out of road with some of her conspiracy theories and the far right now seems to be the platform where she’s hanging her coat.